Your old wood deck needs some care to regain its beauty lost somewhere between constant exposure to the sun and heavy rainfall. Which outdoor decking doesn’t endure years of weather and traffic abuse? Even if you own a rot resistant cedar deck, its beautiful color will still fade away after years lying under the sun. In order to enjoy a world of summer activities, you need to prep the stage and ensure the deck is free of debris and discolorations that will diminish its charm and perhaps hide hazards. And there are three ways to accomplish such goals: sandblasting, power washing, and painting. You can choose the method you want or combine them for the best results. Sandblasting is the technique of cleaning, shaping, and preparing surfaces for repainting. And so it’s an excellent way to take care of your wooden deck. Grime, debris, and filth accumulated on the surface of the deck are all hard to remove. And the last thing you need is to use chemicals that might take their toll on wood and emit hazardous odors. The only drawback with sandblasting is that it leaves a mess but sandblasting companies usually clean up after the job is done and so you don’t have to worry about that either. Another good piece of information is that there are several sandblasting solutions. Depending on the extent of filth, the sandblasters will use low, medium, or high pressure methods. The overall effects of this technique is similar to using a sandpaper to smoothen the surface with the difference that sandblasting is done at high speeds and thus removes dirt & paint residues effectively and faster. It smoothens the surface evenly and preps it for repainting. So actually you kill two birds with one stone. You clean and prep the deck for painting. Power washing is the method of cleaning surfaces with high-pressure hot water. The combination of high water temperatures and pressure ensures the effective removal of debris. Just like with sandblasting, power washing will remove anything from chewing gum and paint residues to mold and filth. The difference here is that water is used on your cedar or ipe decking. 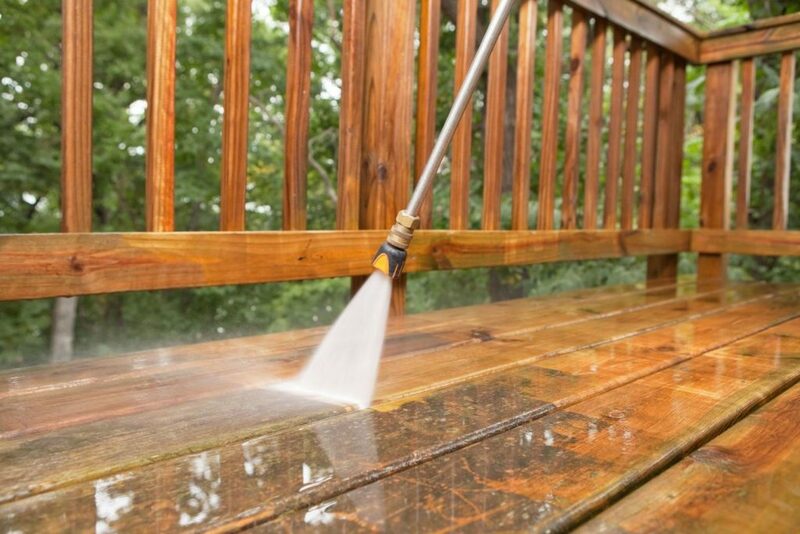 And although it’s common practice for cleaning outdoor decks, power washing uses water which is timber’s enemy. So it’s important to ask if the timber used for deck construction and its current condition will hold well under the pressure of hot water. Painting is another way of renewing the looks of your deck. That’s the best approach of outdoor deck refurbishing if you like to change the color of the deck or paint it a different hue. If you just want to refresh the color of an ipe deck, perhaps you should stain it. 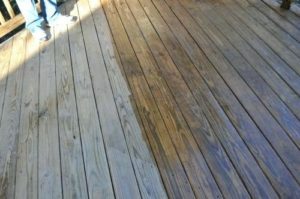 Staining decks is the preferable solution when you want to maintain the color, make the surface less slippery, and seal it but not all woods are ideal for staining. And this method won’t hide flaws or cracks. Painting decks on the other hand will offer you many color options that will change completely the looks of your landscape. Paints hide flaws and make decks easy to clean but eventually peel. The cleaning methods of sandblasting and power washing can be used in conjunction for more effective results. After all, they will prep your deck for repainting and your family for endless outdoor activities.